The KW DDC coilover kit with ECU (Electronic Control Unit) was developed for individual lowering and installation of an electronic damping control system. 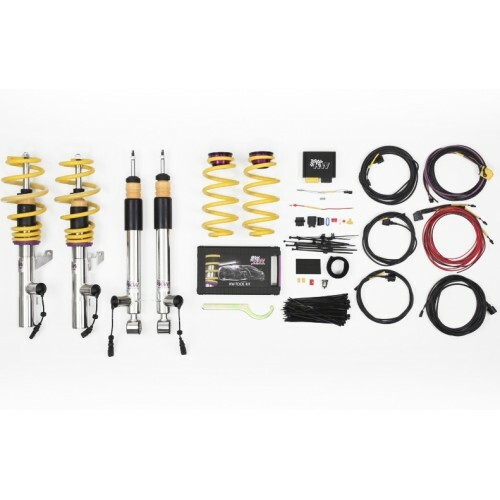 The scope of delivery contains a KW inox-line coilover kit with electronically controlled dampers, a high-performance control unit, the car specific cable set with control switch and a detailed manual for an easy installation. The KW DDC coilover kit has three car specific developed damper settings. By the push of a button the driver can choose between the sport basic setup, a very sporty and performance-oriented Sport+ setup and the comfort mode for uneven/ poor road surfaces. The height adjustment of KW coilover kits also allow an individual lowering within the TÜV-tested adjustment range. The stainless steel technology "inox-line" guarantees that all parts remain movable, even under heavy use and salty winter time. Front Lowering: 1.2" to 2.0"
Rear Lowering: 1.2" to 2.0"